Our first attempt to visit Essendon North's Crème was back in April this year, however when I called on Thursday afternoon to make the booking we were turned away - Booked solid at 7pm on a Thursday. We made a switch at the last second and thats how our "Sporting Globe: Addendum" special attempt came to be. This time around I was ready for them, calling in the booking on Wednesday morning for dinner on Thursday night - I wasn't taking any chances. With a confirmed booking we loaded up the Parma Bus and headed to the extremely busy Crème cafe. Perfect. After a slight wait to get service (like I said, they were busy) we placed our order. Not that there's anything wrong with that, I love a Holgate from time to time, it was just something I wasn't expecting to find in a suburban cafe. After about a half hour wait our meals arrived from the kitchen. Well. This looks surprisingly good! Apart from some slightly soggy crumbs this schnitzel was hard to fault. A decent size, thick, served piping hot and the purest white chicken breast you ever did see. I don't have much more to say ... A tick in every box. The toppings were pretty solid as well. A near 100% level of cheese coverage, grilled to a perfect golden brown hue. It was a little light on napoli, some chunky onion through the mix would have done wonders. The pancetta was ... odd? Don't get me wrong, the slice of crispy pancetta on the top of the parma was a perfect addition, however as you can see from the photos this addition covered about 50 percent of the parma itself. It was a small disk of deliciousness floating amongst a sea of cheese, I found myself having to ration out bits of the pancetta to make it last longer. A great addition, but with another slice or two it would have been perfection. The chips were pretty standard, ho-hum chips. As pretty much everyone said in the quotes below some proper beer battered fat chips would have been fantastic. The unsolicited pots of sauce for chip dipping were a nice touch though, always appreciated. The chopped salad was fresh and crisp, chock full of the onion chunks I was wishing were in the napoli. I quite enjoyed mine but reception around the table was mixed - Some reviewers reporting a lot less "stuff" in their salad than I received. 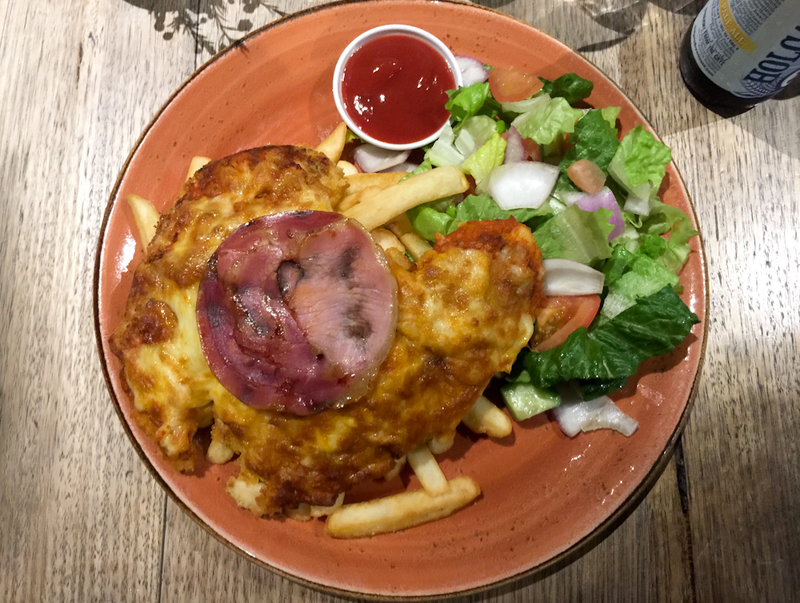 $24.90 is on the pricey end of the spectrum for a parma these days, however you've got to remember this is at a cafe, not a pub, where prices for big mains are usually a little inflated. As its a cafe I couldn't see any parma specials around, although you do get the Herald Sun for free if you go in for breakfast ... Kicking goals. I was surprised at how much I enjoyed the parma at Crème. Normally a parma at a cafe is asking for mediocrity but this one was absolutely delightful. There were a couple of issues with it, sure, but when your next closest option is The Linc directly across the road you take what you can get. Would definitely check it out again.